At Stapp Interstate Toyota we love to keep up with our customers and where they take their Toyotas. We want to hear from you! Do you have a favorite place to drive to or a great road trip story in a Toyota? Submit your stories and pictures to socialmedia at interstatetoyota dot com . And you could be featured in an upcoming blog! This month’s story comes from two of our employees, Jeff and Erin Wuestenberg. Jeff is our Internet Sales Manager. Erin is our Digital Marketing Manager. 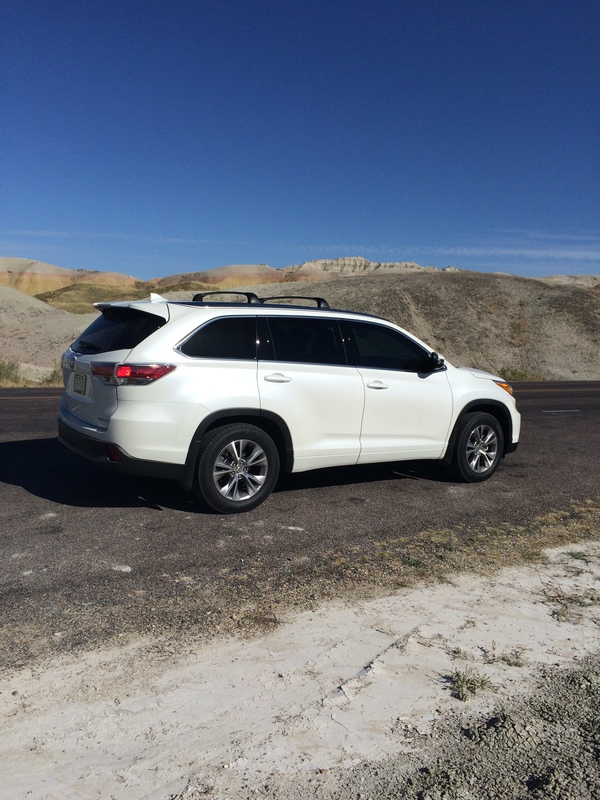 Below is Erin’s recap of her family’s adventure in their new 2015 Toyota Highlander. 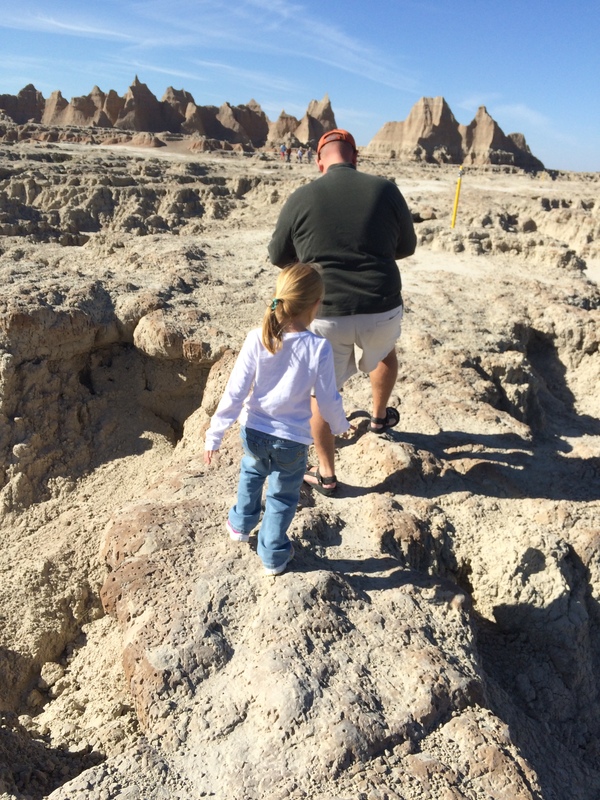 We took our girls ( 5 and 3 years old) to the Badlands/Blackhills South Dakota last weekend. We had leased a 2015 Highlander a few months ago. I was looking forward to how it did on a longer trip. 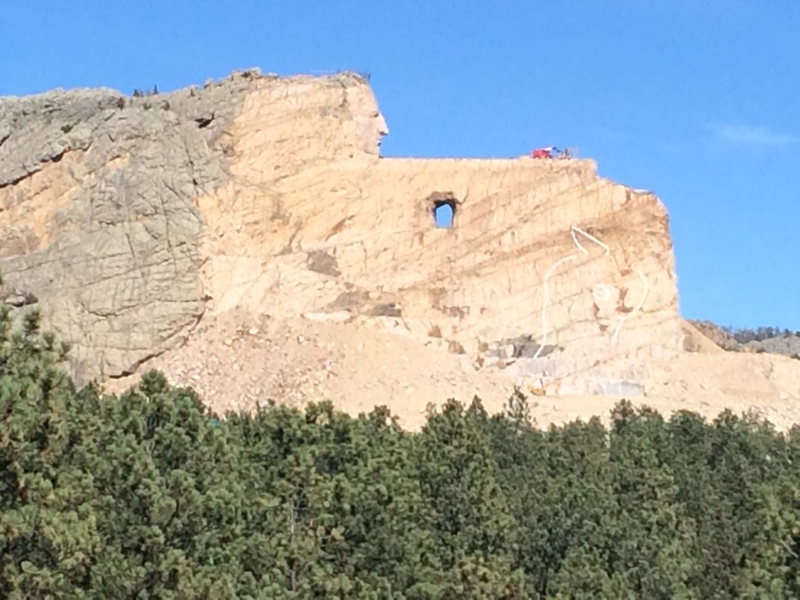 We left first thing Friday morning, it was about a 6 hour drive from where we live to Crazy Horse Memorial. We arrived at Crazy Horse early afternoon, and had no trouble finding a place to park. We watched a short video in the visitor center that detailed the work and progress over the years. We spent about 90 minutes there before the girls were ready to go see something else. We loaded up and headed to Mount Rushmore. Both Crazy Horse and Mount Rushmore are on the way to Rapid City where we stayed. The drive between Crazy Horse and Mount Rushmore is about 35 minutes or so. 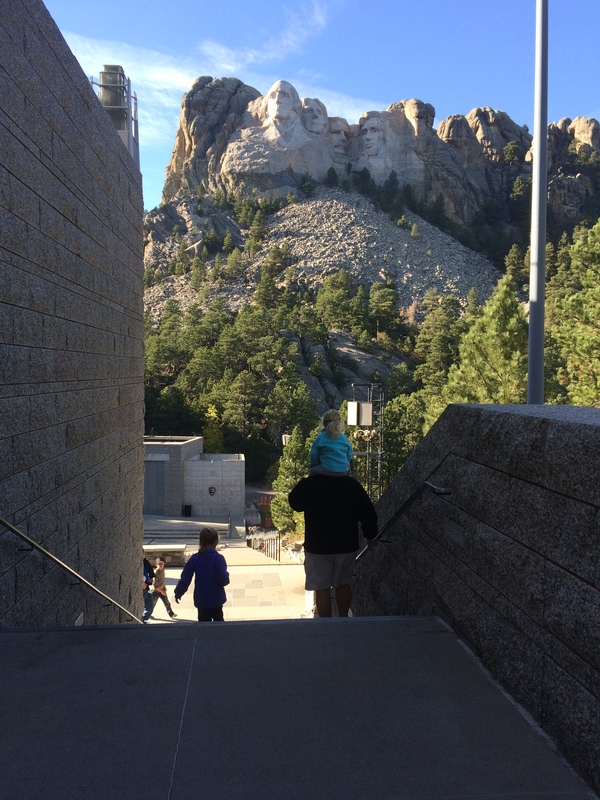 Much like Crazy Horse, there was not much of a crowd at Mount Rushmore either. Our 5 year old was having a little bit of trouble trying to figure just how the faces were carved into the mountain. After walking around and exploring a little more, we headed to Rapid City for the night. Saturday morning we got up and headed to the Badlands. Before we went to the Badlands, we made a stop at Wall Drug. You will see signs advertisting Wall Drug in Wyoming (seriously) and all along I-90. Wall Drug’s claim to fame is they give away free glasses of ice water. It’s a neat little place to stop and look around. All kinds of different shops and things to see. After a quick stop, we were on the road again. The Badlands are a sight to see. As Jeff put it, “It looks like part of the moon fell to earth.” It does have a feeling of desolation and bareness. If you are the only one at one of the many pull off and viewing sights you do get the feeling of being all alone. If you allow it, it can be a very still and quiet place. You start to get the sense of why the Lakota tribe viewed this area as sacred. We spent a good portion of the day in the park. The drive in the park it self was amazing. We stopped at the Visitor Center for a lunch break. The National Park Serivce maintains a small picnic area outside next to the Visitor’s Center. We talked to the Park Rangers about some trails we had read about in the area. We loaded up the girls and we were off again. With in a short driving distance of the Visitor Center is a parking lot with several trail heads. The trails range in distance and difficultly. Several were boardwalks, short and easy. Perfect for 5 and 3 year old legs. Or so we thought. 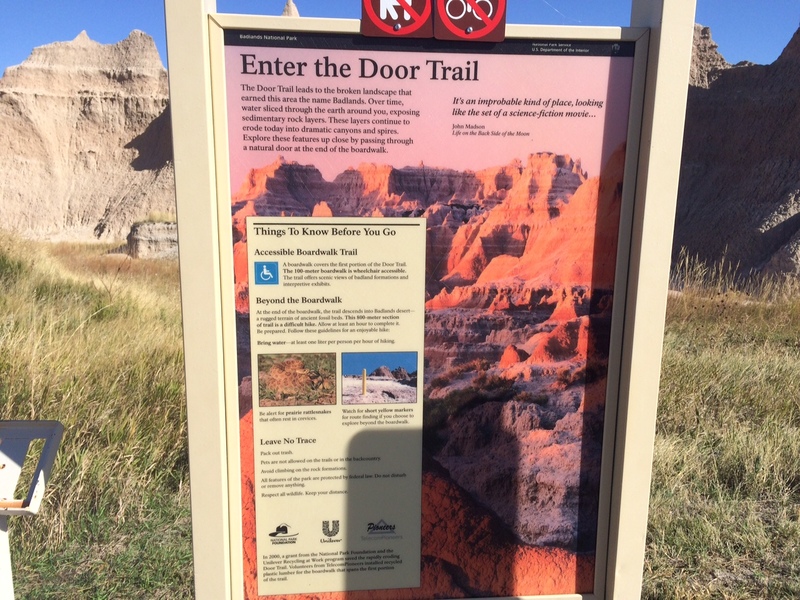 We saw the sign for the Door Trail. Part of it is a boardwalk, the rest of it, well that goes down to the Badlands desert. We decided we would hike the boardwalk part, look around, and hike back. Especially since our 3 year old was wanting to be carried. Our girls had other ideas. They wanted to go hike. Jeff and I decided we would try it. If at any point the girls werent having fun, it was too difficult or it was getting dangerous, we would immediately turn around. We told the girls it was going to be a difficult hike, they need to follow exactly where Daddy walked, and to listen to whatever we told them to. 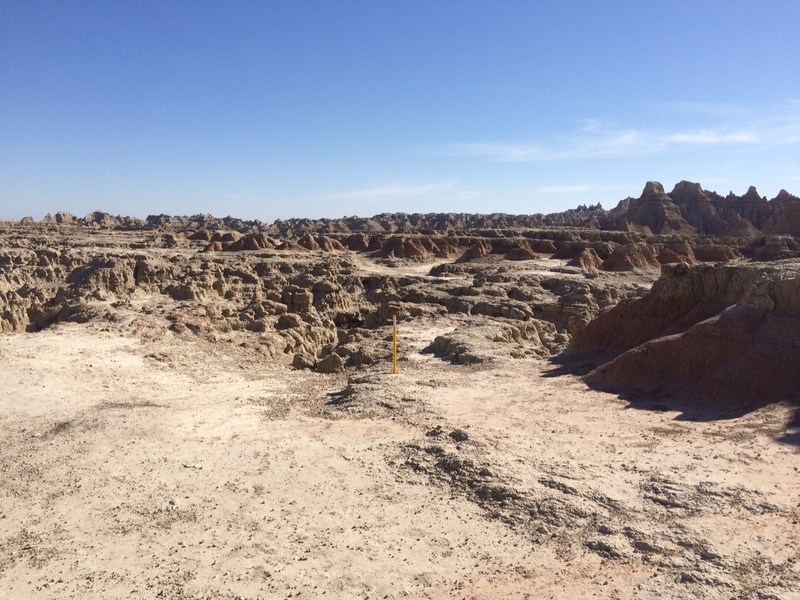 We hit the end of the boardwalk and off we went into the Badlands desert. The girls loved it, completed the whole trail on their own. The 3 year old who had just been whinning to be carried? Never heard a peep. She wanted to hike that trail all on her own. Both girls did great! (Side note, this is not the first time our girls have hiked or been on little more challenging hike) After the hike everyone was ready to head back to the hotel to relax for the evening. Sunday we headed home. We took a detour through Custer State Park on the way home. The drive through the park didn’t add any addtional time on our over all drive time. A few things we took away from our trip. Going to National Parks, Monuments, etc, in the off season is wonderful if you want avoid crowds. The only draw back is some business are closed for the season, plan a head. I loved traveling in the Highlander. It had plenty of room for everyone and all our stuff. The car rode really well too. We have an XLE with Captian’s Chairs in the middle row. This added a little extra space between the two girls, which on a long road trip was nice. We still had our trial period on the XM/Sirrus radio. We never once lost the signal. Our Highlander has worked out so well for us!